The highly-concentrated sugar content in honey has made the substance both a common food and a medicinal remedy throughout history. Although honey is most often used as a topical remedy to treat wounds and burns, you might also consume honey to treat high cholesterol. Before you take honey to lower your cholesterol levels, talk with your doctor about the possible health risks and other treatment options. Honey contains high levels of glucose and fructose sugars, which offer antimicrobial actions to prevent or treat infections, says the University of Pittsburgh Medical Center. Honey may also have the potential to reduce your cholesterol levels. In addition to its antimicrobial and cholesterol-lowering actions, honey may offer antioxidant, cough-suppressing, blood sugar-lowering and laxative effects. The phytonutrients in raw honey could even help prevent cancer and offer anti-tumor actions, notes the World's Healthiest Foods website. Don’t use honey for any medicinal purpose before first consulting your physician. In addition to treating high cholesterol, honey is most commonly used topically to treat cuts and scrapes, says the University of Pittsburgh Medical Center. Honey’s antiseptic properties have some use in preventing or treating infections and promoting healing of wounds and burns, according to the Memorial Sloan-Kettering Cancer Center. Manuka honey made from the Leptospermum scoparium shrub’s pollen and other types of raw honey have long been used as treatments applied to the skin to heal wounds, ulcers and other skin abrasions. You might also use honey to control your blood-sugar levels if you have diabetes and ease gastrointestinal problems such as constipation. Honey may help treat hay fever or seasonal allergies and alcohol intoxication by helping your body to process alcohol, notes the University of Pittsburgh Medical Center. Additionally, honey’s antibacterial actions may help treat gingivitis and improve your dental health. Honey has some potential for improving your immune-system function, suppressing coughs and restoring the balance of “good” bacteria in your gastrointestinal tract, World's Healthiest Foods says. No widely-accepted, conclusive medical research supports the use of honey for treating or preventing any health condition, however. You might take 1 to 5 tbsp. of honey two or three times per day to lower your cholesterol, says the University of Pittsburgh Medical Center. You could increase your antioxidant blood levels by consuming just 4 tbsp. of honey each day, World's Healthiest Foods notes. In fact, a study by N. S. Al-Waili found that taking these amounts of honey daily improved blood-sugar control and cholesterol profiles in people with diabetes and high cholesterol, according to a 2004 issue of the "Journal of Medicinal Food." 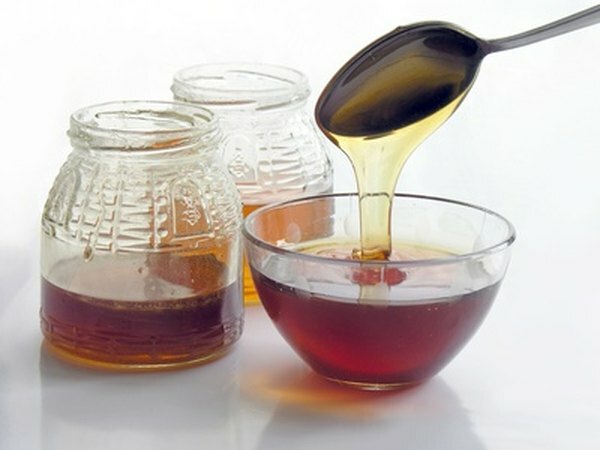 One of the main health risks surrounding medicinal honey is an allergic reaction, notes the Memorial Sloan-Kettering Cancer Center. Honey can also sometimes raise your blood-sugar levels, so discuss taking honey with your doctor if you have diabetes. Manuka honey’s antioxidant actions could potentially reduce the effects of chemotherapy. Don’t give honey to babies under the age of 1 year old, because there is a high risk of infant botulism, warns the University of Pittsburgh Medical Center. Otherwise, honey is considered very safe due to its long history as a widely-consumed food substance.